I am delighted to say that this edition of World Catalina News is pretty upbeat with plenty of good news from around the world. Please note that this article is taken from the hard copy version of The Catalina News magazine which is distributed to paid up members of The Catalina Society. Perhaps the most positive news concerns New Zealand’s former-RCAF Canso A ZK-PBY. Registered to The Catalina Company NZ Ltd of Papakura, Auckland it is operated by the New Zealand Catalina Preservation Society Inc and has suffered the misfortune of being grounded at New Plymouth since 2011 due to the need to carry out extensive and expensive remedial work to the wings and floats. 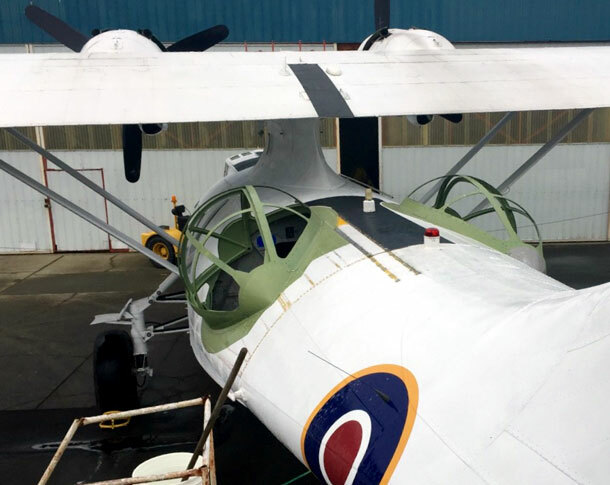 Following several years of very hard work and fundraising, the work was completed this Spring and ‘PBY made her first post-restoration flight on February 28th. 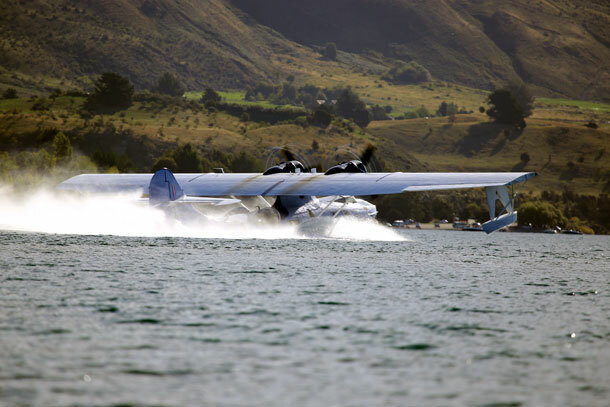 This meant that the Catalina was able to meet the operator’s target of being airworthy in time to appear at the Warbirds Over Wanaka International Airshow on South Island over the Easter holiday. Not only that but it got back onto the water again, operating initially from Lake Taupo for crew training then from Lake Wanaka during the show weekend. ZK-PBY has not yet been repainted in the full RNZAF livery previously carried but it does have a new name – The Wandering Witch. Wanaka was also the scene of a ‘Z-CAT reunion’ – see our back cover. All those involved really must be congratulated on a superb effort to return this lovely aircraft to the skies – and water! More good news concerns another ex-Canso A C-FUAW in British Columbia. Having flown again last summer after a period of refurbishment, the restoration team has spent time this winter installing a beautiful set of original waist blister turrets on the rear hull. The operation did not quite go to plan as the first set to be acquired did not fit too well and another set had to be used. As the accompanying pre-glazing photo shows, the blisters look great! Owner Bob Dyck hopes to display his Canso’ at shows again this Summer including those at Abbotsford, Boundary Bay, Vanderhoof and, possibly, Tofino, all in British Columbia. Staying in Canada for a moment, the Save the Canso Team at the Fairview Aircraft Restoration Society (FARS) at Fairview in Alberta continues to work on yet another Canso A, C-FNJE. FARS was formed to be the operating wing for the Canso and is currently coordinating the restoration project, raising funds to help rebuild the aircraft and planning to provide hangar space for ‘JE and other historic aircraft. Upon completion of this restoration, FARS will organize demonstrations at airshows and community events to provide school children and the general public the opportunity to share in a part of Canada’s rich history. C-FNJE was a forest fire fighting water bomber, latterly with Buffalo Airways Ltd, but it sank in Sitidgi Lake, 40kms east of Inuvik in the North West Territories in July 2001. After salvage it was acquired by Don Wieben and underwent an amazing recovery operation to its current home where it has been worked on by volunteers since. The restoration team’s aim is to have the aircraft flying again, possibly as early as this year. Canada’s other airworthy Canso A C-FPQL Mary K is with the Canadian Warplane Heritage (CWH) collection at Mount Hope, Hamilton, Ontario and over recent months it has been undergoing a great deal of work before it takes to the air again. Externally, the most obvious work has been to install a forward hatch on the port side of the hull. This hatch is very similar in design to the one on our own Duxford-based Miss Pick Up. However, much of the work has been done inside the airframe where some 1,100lbs of water bombing equipment including the pick-up probe mechanism has been stripped out together with obsolete hydraulics, electrics and old radios. New radios and navigation equipment has been installed and eight de Havilland Canada Dash 7 seats will be put into the hull. The latter will enable the CWH to give rides in due course. A bow turret is held in stock for eventual fitment. At the time of writing all this work was close to completion and it is hoped that C-FUAW will fly again this year. On the subject of Canadian water bombers, some of them ended up in Europe when their contracts in North America dried up and they were put to work in Spain and Portugal. In due course, these contracts also came to an end and the various Catalinas were dispersed including no less than three to Australia. However, one, PBY-5A EC-FMC, was acquired by Swede David Pajus who intended to get it airworthy and fly it to Scandinavia. As reported in our last edition, plans did not work out as expected and, in particular, there were problems concerning the engine’s paperwork that greatly delayed the project. However, after many years languishing at Ocana in Spain its future now seems assured! On January 20th it was assigned the US civil registration N24VP and on February 10th a Certificate of Registration was issued to John T Sterling of Bandon, Oregon. The really good news is that it will be restored to airworthy condition and flown to the USA. Once there, it may well spend some time at the Pacific Aviation Museum at Pearl Harbor, Hawaii where John Sterling is a Board member and original founder of the museum efforts on Ford Island. What an appropriate destination and a dream come true for the collection no doubt. John also intends using the Catalina to celebrate various Pacific theatre 75th anniversaries as they arise in the next few years. 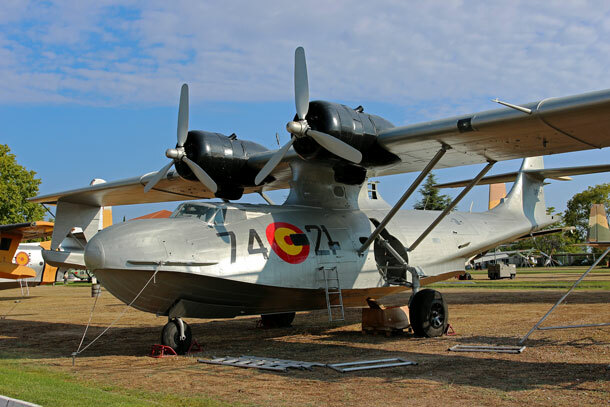 One fire fighting Catalina that remained in Spain (with N24VP’s departure it will be the only one) is PBY-5A ‘DR.1-1/74-21’ at the Museo del Aire, Cuatro Vientos, Madrid. After arriving from Canada it saw very little water bombing action and ended up in the museum painted in colours to represent a wartime Catalina of the USAAF that was impounded by the Spanish and later taken on by its air force. Having spent many years in the open, the livery had become faded and tired but recently it has been repainted and it looks great – indeed, the best it has looked since going to the museum’s collection. Reported as our lead item in the Autumn/Winter 2015 magazine was the shocking demise of the Wright Cyclone-powered PBY-6A N85U when it was destroyed by a salvage team after encountering problems during filming off the Alabama coast in June last year. 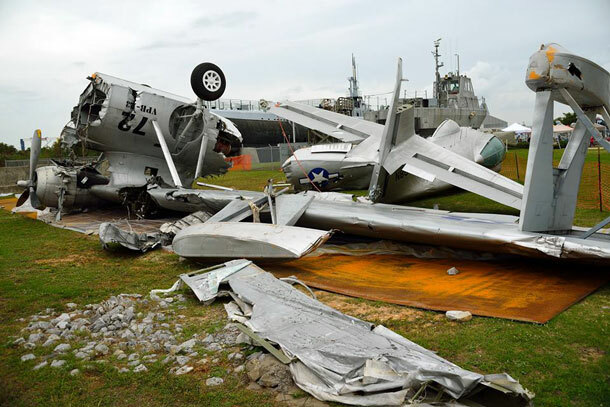 The somewhat happier outcome is that, whilst the aircraft will never fly again, its mortal remains were acquired for a token $10 by Dr Barry Booth so that they could be removed to the nearby USS Alabama Battleship Park Museum in Mobile, AL. The museum has a substantial collection of aircraft already although quite what will be made of N85U’s wreck is anybody’s guess. At least it has been saved from scrapping anyway. I mentioned last time that the storm damaged Canso A N68740 had been acquired by the Tucson-based Pima Air & Space Museum from its former owners Lone Star Flight Museum of Galveston, TX. The aircraft duly arrived at its new home by low loader in December and some restoration work has already commenced including a repaint in its former RCAF colours as 9742/X. 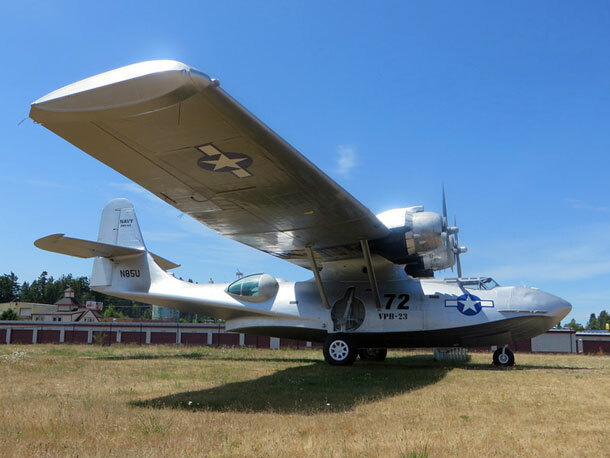 Go to http://www.catalina.org.uk/consolidated-pby-catalina-survivors-list/ to download the full Survivors listing.